Is it the sign of a good gallery if the security guard’s eyes follow you around the room? In the case of the Museo Municipal De Belles Artes in Santa Cruz it was sadly more down to loneliness, as I was the only visitor for much of my midweek trip. 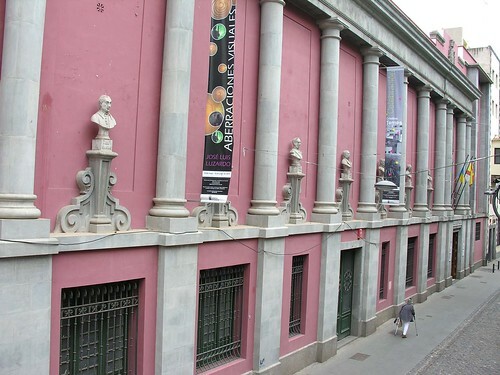 You don’t know what you’re missing; the grand lilac fronted Museum of Fine Arts looks the part from the moment you find it in Calle Jose Murphy, behind the Plaza del Principe. The busts stare down from their alcoves between the stone columns; they finally settled down here when the building opened in 1933, the collection itself was started in 1900. Racing up the stone stairs to the first floor, I was stopped in my tracks by a very impressive stained glass window, the sombre tone it suggested was soon dispelled when I entered the contemporary art hall. First up was Celebration, a large bright collection from Santa Cruz artist Cristina Temes. The paintings were impressive. 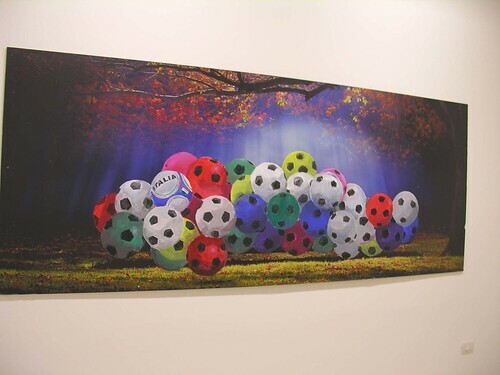 I was predictably drawn to the football piece, but following into a dark room at the back I found some visual art including light projections on thin canvas. Next door was something even more testing on the senses, a dark room featuring three micro short films by Jose L Luzardo. 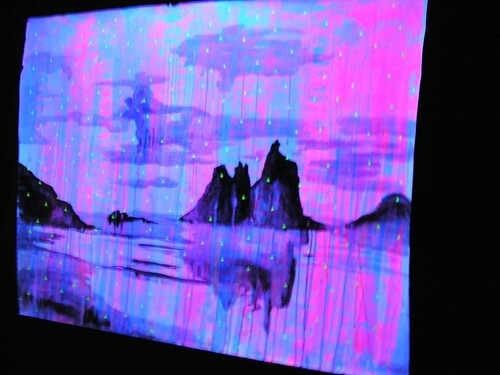 Aberraciones Visuales was a visual tease with an eyeball’s view of night violence, slightly naughty animals and a light and music show from a mobile phone. I like weird, it’s just my cold cup of tea with marmalade and gravy stirred in. You have until 13 June before these contemporary treats change. Up the stairs to the sprawling and more traditional gallery, a sculpture of a boy busker by Aurelio Carretero greeted me. The detailed quality was confirmed by the name plate stating it was on loan from the Prado gallery in Madrid. A series of open and interlocking rooms drew me through a world of huge portraits and local history. Much of the first section centred on the Marques de Villaseguro; his furniture, his art, and his benevolent projects around Santa Cruz. 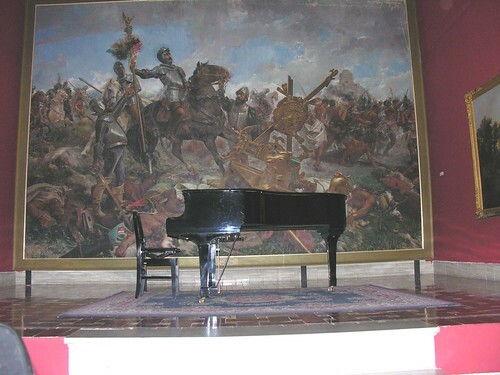 A room at the end opened out into a small concert hall padded with imposing paintings, I was told the piano was tinkled on fiestas and special events. Most of the works are loaned from private collections. 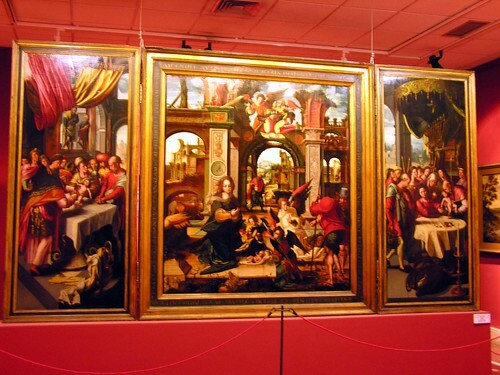 One of the most valuable is the triple treat Tripitico de Nava Y Grimon by Flemish painter Pieter Coecke. Once I had admired it from several angles I noticed that it is owned by Cepsa, the oil company, better than trusting your money to banks these days. Culturally uplifted, I left the museum and admiring the statues on the nearby Circulo de Amistad building. I was pleasantly surprised to find that they were sculpted by Pedro and Eduardo Tarquis, and Teodomorio Robayna, the driving forces behind the founding of the Museum of Fine Arts. Open Monday to Friday ““ 10am to 8pm, Saturday and Sunday 10am to 3pm.